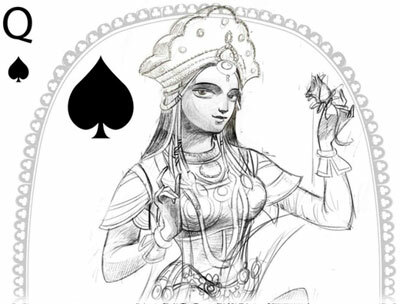 Bharata Playing Cards - series 2 - by Sunish Chabba & Ishan Trivedi evoke the kings, queens and warriors from the stories of the Mahabharata, the epic Sanskrit poem from India. 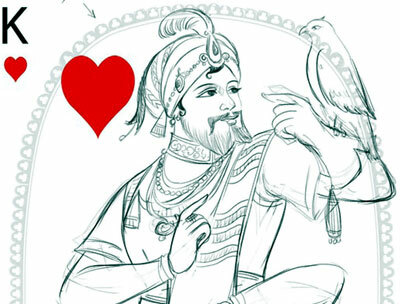 The court cards are presented in the sensitive and refined style of Kishangarh paintings. 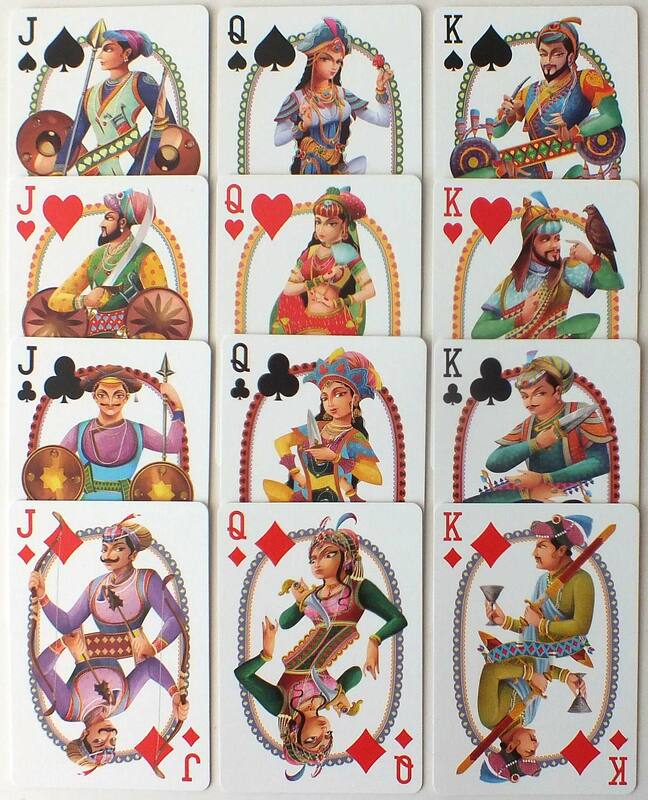 Combining these with the Bharata tarot makes a full 78 tarot deck but these cards can be used separately. 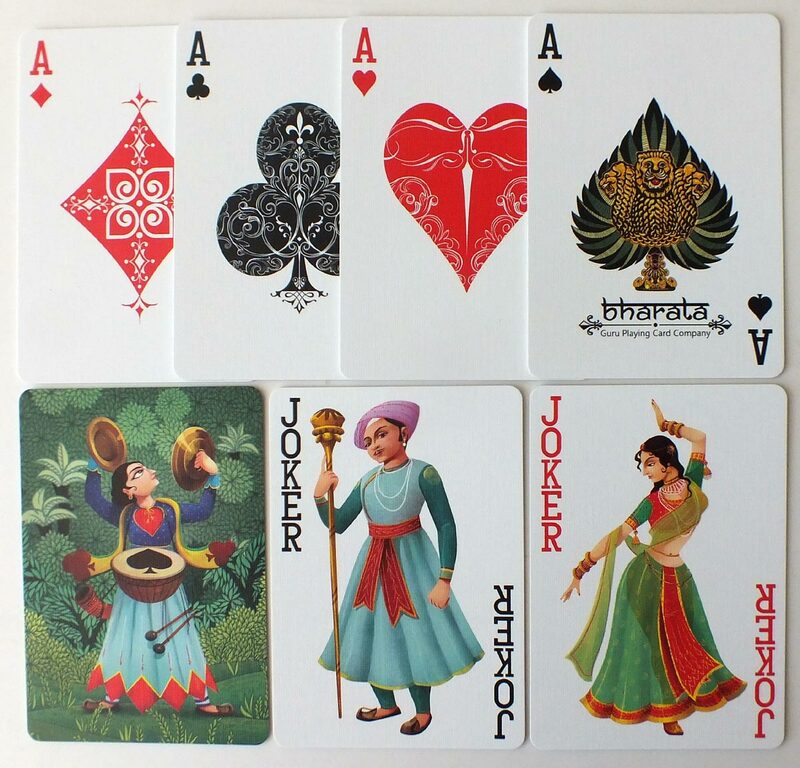 Above: Bharata Playing Cards - Series 2 - published by Sunish Chabba in collaboration with Indian illustrator Ishan Trivedi, printed by WJPC, 2018, limited edition, 56 poker sized cards that include 3 jokers and one double backer (gaff card) in elegant tuckbox printed with silver foil. For those unacquainted with Kishangarh painting, it emerged as a distinctive style in the middle of 18th century under the patronage of Maharaja Sawant Singh. Nihal Chand, a gifted artist in the Maharaja's court, produced some highly individualistic Radha and sophisticated works. The chief characteristics of the Kishengarh paintings were the elongation of human faces, lavish use of green and depiction of panoramic landscapes. Portrayal of Radha and Krishna in elongated faces is a common subject of Kishangarh paintings. The elongated neck, the long stylised eyes with drooping eyelids, the thin lips and pointed chin of Radha standing in a graceful pose with her head covered with a muslin odhni, is undoubtedly the most striking creation of the Kishangarh school. Cards and notes courtesy Sunish Chabba.